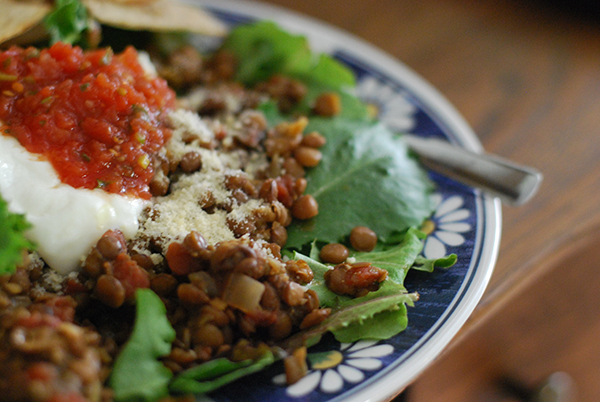 Y’all have requested more lentil recipes…and I can understand why. 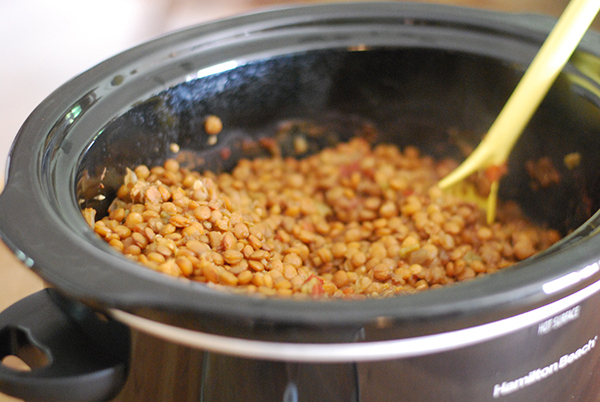 Lentils are just stinkin’ delicious…pun intended? Ha, ha! Beans, beans, the magical fruit! The more you eat the more you…uh, yeah. I digress. 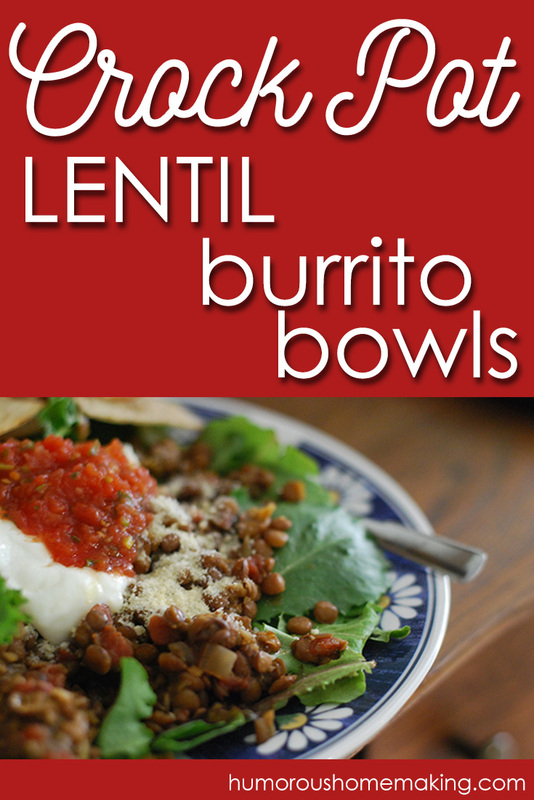 I only have two lentil recipes posted on this site: Buttered Lentils and Lentil Vegetable Soup. Those are both delicious. We love beans around here…and if everyone eats them, any negative effects are cancelled. Can I get a witness?! Plus, beans are cheap. I love cheap things…no, actually I don’t. I don’t love CHEAP things. I love FRUGAL things. Big difference. So, it was my goal to make a meat-less taco. Then I decided I would just make them into burrito bowls – because I love Chipotle and anything that reminds me of Chipotle is a winner in my book. You can add a homemade baked tortilla bowl to this recipe if you like…but we just like to eat it on plates like a taco salad/burrito bowl salad. You can also serve this as a big ole bowl of beans and forget that tacos even exist. It would be super delicious with a piece of steaming hot sourdough bread. But why would you want to forget that tacos exist? That sounds almost sacrilegious. Beans are always a great idea to cut back with your grocery budget. Beans and rice, rice and beans. If you’re struggling in your grocery budget, try using more beans. They are excellent in replacing some of the ground meat in recipes. And now, I could go on and on about beans but I’ll stop – because they are a favorite topic of mine…ever since high school when I got sent to the principal’s office for singing “Beans, beans! Good for your heart! The more you eat, the more you…” Uh, yeah. Beans. 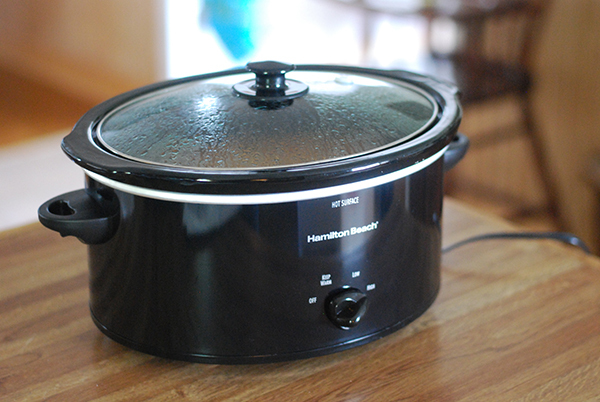 Combine all ingredients, except toppings, in a 5 quart crock pot. Cover and cook on HIGH for 6-7 hours or until beans are tender and mixture is thickened. A friend suggested this recipe to me. I made it as suggested but I added 1 pound of ground meat (with taco seasoning) to get my fiancee to eat lentils. We made burritos with shredded cheese, sour cream, lettuce and taco sauce. He loved it and was surprised when I told him that was made with lentils. My 15 month old son LOVES them. I am making him another batch and this time I am going to add some shredded chicken. I would (and have) recommend this to everyone I know! Thank you for a wonderful recipe. That’s great!!! Thanks for letting me know! Hi Stacy! I’m so curious what the powdery/sparkly topping is in the picture of this meal – it looks like sugar, but it must be something else. What have you used? That would be Parmesan cheese. 🙂 A little goes a long way. Ah, thank you! Somehow it looked browner and more translucent, like raw sugar. I was thinking of shredded parm, but good to know I can use the kind out of the shaker can. Thank you! Making this for the second time. This time I will put it as a filling for enchiladas. Thank you for the recipe. I made this for dinner last night. I replaced the fresh onion, tomato & green peppers with a jar of salsa because I had it on hand and I’m frugal like that. 😉 I was in a hurry and didn’t measure the water so the edges dried and burned to the crock pot. Even with all that tampering, it was still good! Served it with cheese, sour cream and tortilla chips. My husband said he’d eat it on a taco shell even without the meat. This was my first experiment with lentils. Now I’ll be using them all the time. Thanks for opening a whole new world to me. Stacy these look great! I LOVE crock pot meals! Thanks for sharing these with Simple Meals Friday, we featured this post. Lentils are so good – but I understand the fence riding…my 4 year old is on the same fence. We love lentils, too! We often cook them in a baking dish with water and spaghetti sauce, then cover them with melted cheese – it’s almost like pasta! And yummy with sourdough! 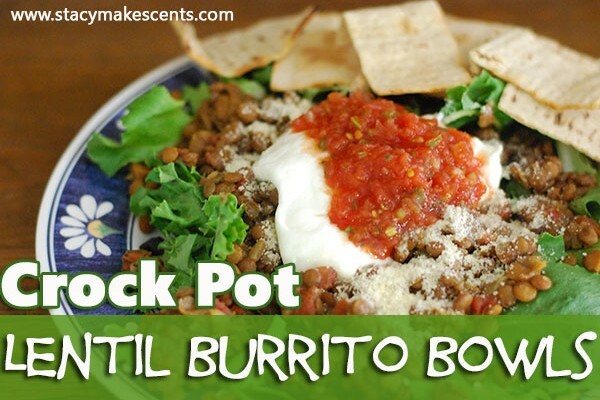 This looks delicious, and I love using my crock pot. Especially in the summer. Thanks for linking up at Gluten-Free Wednesdays. I’ll be highlighting your recipe this week. We will just love this dish! Thank you so much for sharing with Full Plate Thursday and have a great week! thanks for linking up to friday food frenzy. What a great vegeterian option for taco tuesday. They are so versatile! I hope you love them too. Love this! I have never tried lentils in place of meat, believe it or not. I have good intentions too. But now, with this recipe, hopefully I will actually do it. 🙂 Pinning and trying later! 🙂 Thanks Stacy! Wow, a lentil dish I actually like (finally)! Made it for dinner tonight, topped with cheese & sour cream 🙂 So good!! I’ve always cooked my beans together with tomatoes and not noticed anything…I’ll pay attention next time. 🙂 But, I don’t like crunchy beans. Yuck! I can’t wait to try this! I’ve been wanting to add more lentils to our diet (since they’re sitting in our pantry…lol) 🙂 If I soak the beans, do you think I should reduce the cooking time? No, I don’t soak the lentils. I soak all other beans except these and Chana Dal. Cool, I will have to try give it another try. I like the idea of being able to put it all together and be done and not add the salt and tomatoes later. I did try this today and it turned out great. Mine actually cooked on high for two hours and was more than done! This is perfect for us, because it’s an easy, safe, and high-in-protein food that my 11 month old can feed herself. Thanks for the recipe! I love feeding my babies beans! Are the Lentil soft when done cooking or are they still kind of chewy/crunchy? My experience has been that adding acid like tomatoes or salt before lentils are mostly cooked causes them to have a hard time fully cooking. Do you soak the lentils first? No – that’s totally not the wrong lesson! Go. To. Chipotle. Okay, I’ve heard of Chipotle’ so the next time I see one(they aren’t in my town), I’m pulling over. Did I learn the wrong lesson on this post? Hehe. I have tons of lentils. I cut hamburger with them in anything I can, ie sloppy joes, chili, etc. What’s not to love? No soaking–fast. Not as fast as Chipotle’ though probably. Oh how I LOVE cilantro! Me too, but not with everything. We cloth diaper my son, and we bought quality brands like bumGenius and charlie banana. We bought secondhand and saved 50% off retail, but I didn’t want to give up quality for price. You know? I just bought a bag of lentils for your “unstuffed pepper stoup” recipe in Crock on. I was wondering what to do with the rest of the bag! I’m going to pin this for next week’s meal plan! Hooray!!! 🙂 Might as well use them all up in a hurry! 🙂 I always keep lentils on hand because we love them! I love that. My mom says that I’m cheap when it comes to food, I try to use up everything. I quip back that I’m frugal or money savvy. The funny part is that she’s jealous of my grocery bill! Oh wow! I can tell by this recipe that we will love it. On my way to get my crock pot out right now. Thank you!! This will be on my list soon! Love lentils. I’ve done lentil tacos but didn’t do them in the crockpot. I’ll add a little cilantro to the top. Thanks!